Happy Memorial Day! Do you have any fun plans? I’m at my parent’s house today grilling and preparing for London. I leave tomorrow afternoon and I’m crazy excited and nervous. This is my first time flying internationally alone (to the busiest airport in the WORLD) and I’ve never left the kids for this long. I know they’ll be fine and have a blast but I’m going to miss those ornery nuggets after awhile. Figuring out the public transport, transferring some cash to pounds and getting to Joel’s London office to get the keys to our flat (yep, I’m speaking as the English do….I won’t stick out at all) has me all kinds of anxious but I have directions printed and hoping for some friendly locals if/when I get lost. But back to Memorial Day. Nothing is better on a summer holiday than breaking out the grill. And while burgers, hot dogs and bratwurst are nice I thought buffalo wings would be a nice change to throw on the grill. It gives them a yummy smoky flavor that compliments the spicy, traditional buffalo sauce they are slathered in. I’ve been planning to grill wings for quite some time now but every time we would go to make them I would always default to our favorite variety since they are just so dang good. But this time I was determined to try them (and also trying to keep dinner healthy) so the grill it was for these guys. I started out by marinating them in some hot pepper sauce for a few hours beforehand to provide an extra kick of spice and flavor. Then throw them on the hot grill and whip up the super simple 5 ingredients buffalo sauce. Flip and slather those wings a few times until they are coated and caramelized. 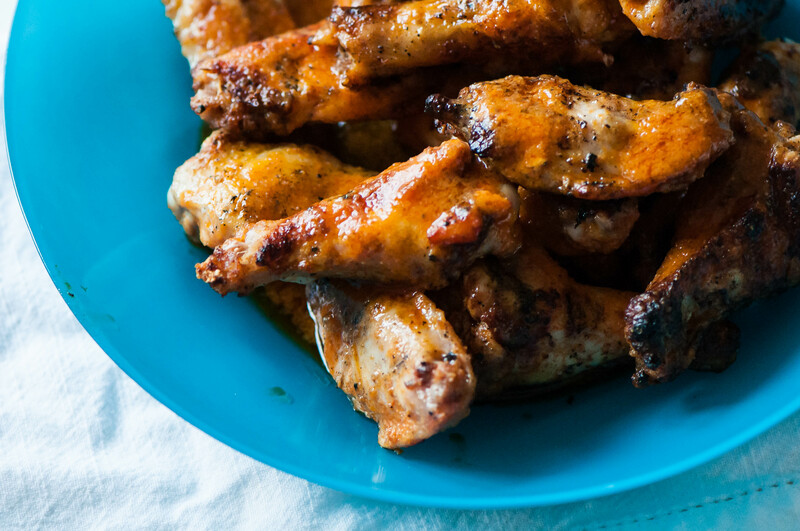 Then remove them from the grill and dunk them into your favorite bleu cheese or ranch dressing to bring a creamy, cool element to the spicy, charred wings. And since they are grilled, you don’t have to feel guilty about eating half the batch all by yourself. I’m here for you friends. Marinate wings in 1/4 cup hot sauce for 4 hours to overnight. In a small saucepan over medium low heat, combine butter, remaining hot sauce (6 tablespoons), honey, garlic powder and salt. Cook until everything is combined. Grill wings at 350 degrees F, flipping every 5 minutes. After 10 minutes, brush with some of the buffalo sauce. Flip 5 minutes later and brush them again, cooking another 5 minutes. Remove from grill and toss with remaining buffalo sauce.